The difference between Pavilions: Cedar Pergolas and Gazebos. Different kinds of pavilions offer different benefits and features, so it's wise to know about the different types when you're making decisions about your landscaping. The word "pavilion" refers to a classification of structures. Pavilions are free-standing structures situated a short distance from a main residence. They can be large or small, but their purpose is for relaxation and pleasure. 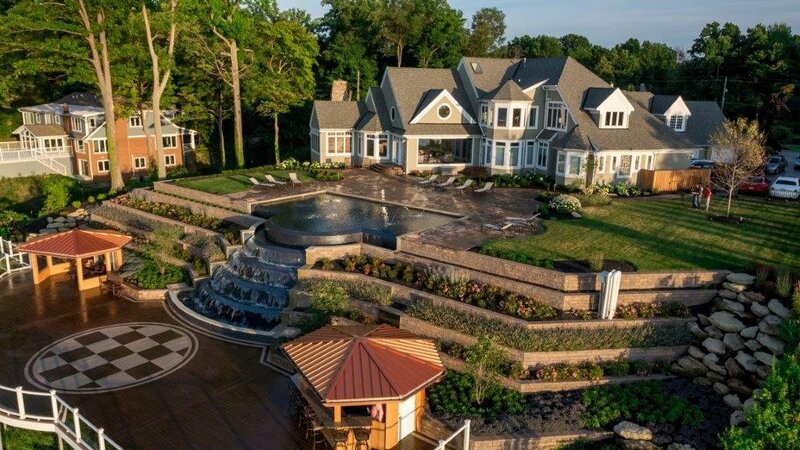 Within this classification, there are two specific types of structures that are ideal for our Cleveland-area climate: cedar pergolas and gazebos. Create privacy. A pergola can create privacy if you need to shield a part of your yard from the street or from neighbors' views. Add architectural detail. 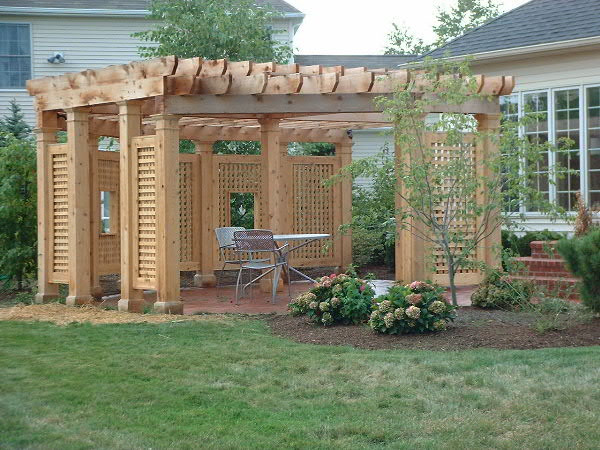 Cedar pergolas with bold lines add visual interest to your landscaping and can bring out your home's best features. Plan a charming nook. If your landscaping is full of broad expanses, use a cedar pergola to create a homey nook, perfect for conversation and company. Make a home for plant life. The pillars and roof of a pergola are perfect for adding more greenery to your landscaping. Plant climbing vines for your pergola to host. Create a grand entrance. A pergola over a walkway makes for a dramatic entryway to your backyard, a garden, or an outdoor room. Your visitors will always feel welcomed when they walk beneath your cedar pergola. Enhance your outdoor dining. Use cedar pergolas to create outdoor dining rooms. With careful planning, you can design a pergola with built-in seating and even incorporate a fireplace into your design. Make a focal point. Even a very small gazebo can make a great focal point for your yard. If you only have room for a small gazebo, consider incorporating built-in seating to your design. Create some shade. A gazebo offers welcome shade to a yard that doesn't yet have many mature trees. Enhance your garden. The vertical lines and the roof of the gazebo offer striking contrast to an area of your landscaping that is dominated by foliage. Anchor an entertaining area. If you have a patio or a concrete pad that looks directionless or wayward, anchor it with a gazebo in one corner. The gazebo will give the patio purpose and provide a shaded spot for your buffet table. Install lighting. A gazebo with built-in lighting gives you more options for evening entertaining. It also creates a dramatic effect in your backyard. Install electronics. A gazebo that is wired for electricity provides you with options for including electronics in your landscaping. Have you ever wanted to watch a football game during a barbecue? Install a flat-screen television in your gazebo. Need music outside? Wire the gazebo for speakers. As you can see, cedar pergolas and gazebos can perform many functions in your landscaping, especially when they're incorporated into an overall landscaping design. Contact us to find out more about how pavilions can improve your landscaping and provide your family with relaxing places to spend time outdoors.